This is a very unusual Magickal item, it is called 40 locks, Chehel ghofl it has the ability to unlock the locks, these locks are symbolically blocks, the blocks in our life are always caused by negative thoughts and actions, often from the evil eye, envy and dark magick that blocks sustenance, libido, opportunity, health and other such issues, these 40 keys are to unlock the 'locks' or blocks in life, whatever negative issue is effecting your growth or abundance, relationships and all levels in money, love health, whatever it maybe, one key is designated for each problem, an intention is made to unlock the block by drinking the water from the bowl daily for 40 days for each block, and solve the issue, water is placed into the bowl which is etched with magickal symbols, the water is left for 5 mins and then consumed, this must be done for 40 days daily and the issue will be unlocked and solved. Can be used without limits a very powerful healing and magickal tool!! This is a very powerful item that works miracles, the water can be consumed daily just to purify your body and make you more attractive, it allows your body to hold more light and increases psychic awareness, it has more uses then can be listed, any intention can be made, the water acts like magick to bring it into manifestation, many blessings come from drinking such water it refreshes our mind and renews our bodys' fluids, has anti age-ing properties when consumed when used to wash the face, it glows, take it in the shower and use it to ritual cleanse from head to toe making you attractive, firms and tightens skin, will wash away psychic debris and protect you from harm and danger. You can charge other objects by laying them into the bowl with water, it will remove any negative energies when sprayed into 4 corners of a room, refresh aura by spraying the water around you. 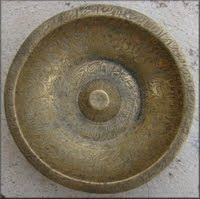 Another such dish is available is known as an Enchanted water Bowl, it is used for charging water and to make wishes, cleanse, remove illnesses, it will bring you to immaculate health if you drink this water daily, it has all of the uses the 'Chehel Ghofl' has (except use of the formula for unlocking 40 blocks). This is one of the most versatile items I am able to offer it has so many uses, and the power of water more then ever is needed at this time. Good for all magick where water is needed, making elixirs and potions, add this water into blue bottle and charge 20 mins in the sun to store, add charged water to larger bodies of water to send the energy to heal the earth. This Magickal artifact is over 1 kg solid brass from Ancient times with engraved magickal Ruh'hani verses was used by thousands of Pilgrims (hole indicates it was used for rituals and cleansing ceremonies in a public place) found among other such treasures buried in the ground near a Sacred Holy site in Ray Persia (the oldest city on earth).